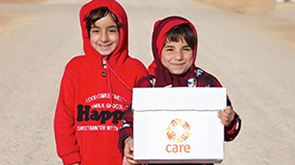 CARE began responding to the needs of Syrian refugees in Turkey in 2014. We provide life-saving emergency assistance to people fleeing from conflict in Kobane and other areas of northern Syria. We are providing food and emergency supplies to families, and supporting women, girls, men and boys to address risks and concerns relating to sexual and gender-based violence, child marriage and gender inequality in the context of humanitarian emergencies. Read how CARE helps refugees when they arrive in Turkey after fleeing from the violence in Syria.